Celestron 9.25 SCT AVX, .63 Focal Reducer, 30 images at 60 secs exposures captured with the Orion G3 DeepSpace Colour CCD camera, 13 then processed in Orion Studio Software and then in Adobe Elements 11. 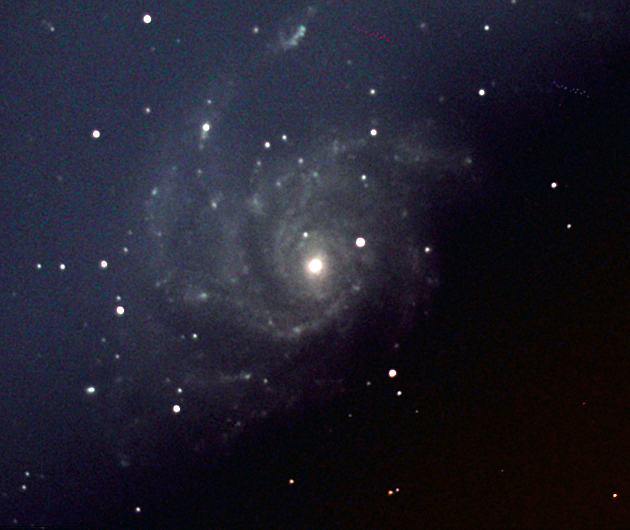 Celestron 9.25 SCT AVX, .63 Focal Reducer, 30 images at 75 secs exposures captured with the Orion G3 DeepSpace Colour CCD camera, 15 processed in Orion Studio Software and then in Adobe Elements 11. A serious sky gradient, mainly due to astronomical twilight has partly obscured the image. Nevertheless, lots of spiral arm structure has been captured. 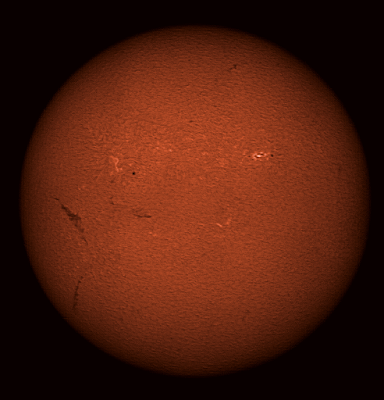 A Solarmax II, 60, BF15 H-alpha scope was mounted on a Celestron Advanced VX, EQ mount. 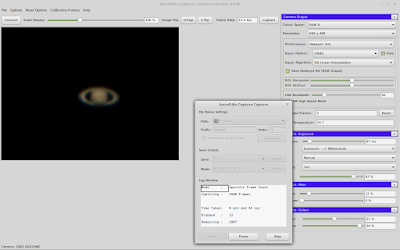 A DMK21AU04.AS camera was placed at the prime focus of the scope and AstroDMx Capture for Linux was used to capture 4 overlapping, 10,000 frame SER files. The best 20% of the images in the SER files were stacked in Autostakkert! 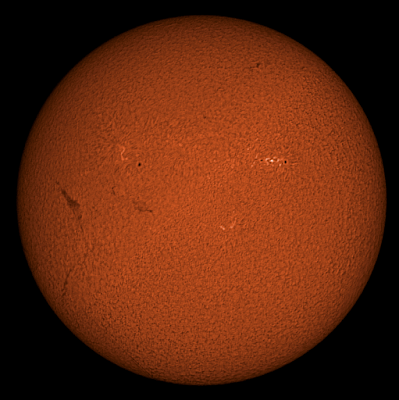 2.6, stitched in Microsoft ICE and wavelet processed in Registax 5.1. The final image was post-processed in the Gimp 2.9. Click on the image to get a closer view. A Coronado Solarmax II, 60, BF15 H-alpha scope was mounted on an iOptron Cube AZ, GOTO mount. A DMK21AU04.AS camera was placed at the prime focus. 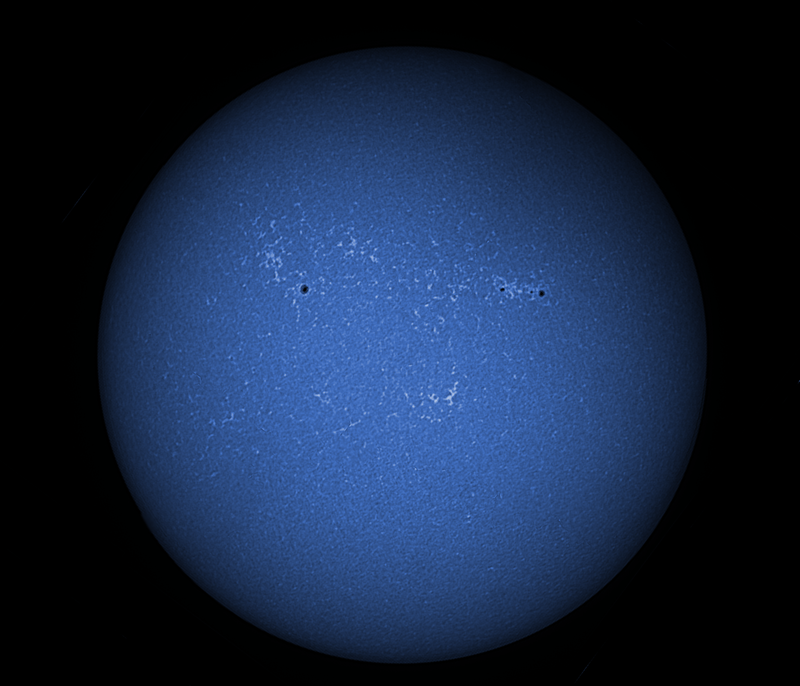 AstroDMx Capture for Linux was used to capture 2500 frames of each of four overlapping quadrants of the Sun. The frames were stacked in Autostakkert in Wine, stitched in Microsoft ICE in Wine and the resulting image was wavelet processed in Registax 5.1 in Wine. The final image was post-processed in the Gimp 2.9. At the same time a Coronado PST, H-alpha scope was mounted on a CG5, GOTO mount. 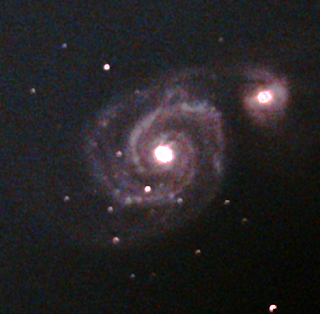 A DMK21AU04.AS camera fitted with the lens of a x2 Barlow, was placed at the prime focus. 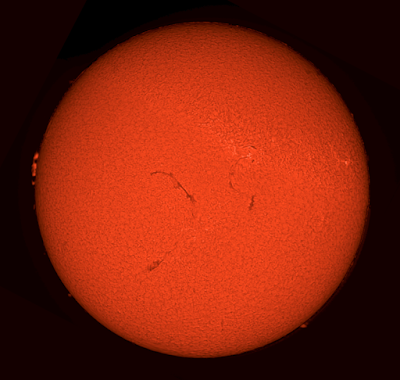 AstroDMx Capture for Linux was used to capture 3000 frames of each of six overlapping quadrants of the Sun. The frames were stacked in Autostakkert in Wine, stitched in Autostitch in Wine and the resulting image was wavelet processed in Registax 5.1 in Wine. The final image was post-processed in the Gimp 2.9. A Coronado CaK PST was mounted on an iOptron Cube AZ, GOTO mount. A DMK21AU04.AS camera was placed at the prime focus. AstroDMx Capture for Linux was used to capture 1000 frames of each of four overlapping quadrants of the Sun. The frames were stacked in Autostakkert in Wine, stitched in Hugin Panorama creator and the resulting image was wavelet processed in Registax 5.1 in Wine. The final image was post-processed in the Gimp 2.9. A Skymax 127 Maksutov was mounted on an iOptron Cube, AZ, GOTO mount. A ZWO ASI120 MC camera was fitted with the lens from a x2 Barlow and attached to the telescope. 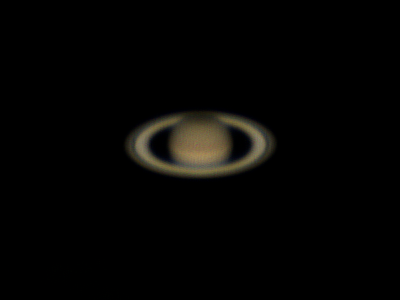 a 2500 frame SER file was captured of Saturn with a ROI of 640 x 480 in 8 bit RAW with on the fly, off camera de-bayering. Manual nudging of the ROI from within the capture software was used to compensate for a small amount of drift across the chip, keeping Saturn in the centre of the ROI. AstroDMx Capture for Linux was used to capture the data. The best 30% of images were stacked in Autostakkert! 2.6 running in Wine and the resulting image was wavelet processed using Registax 5.1 also in Wine. finally, the image was post-processed in the Gimp 2.9.